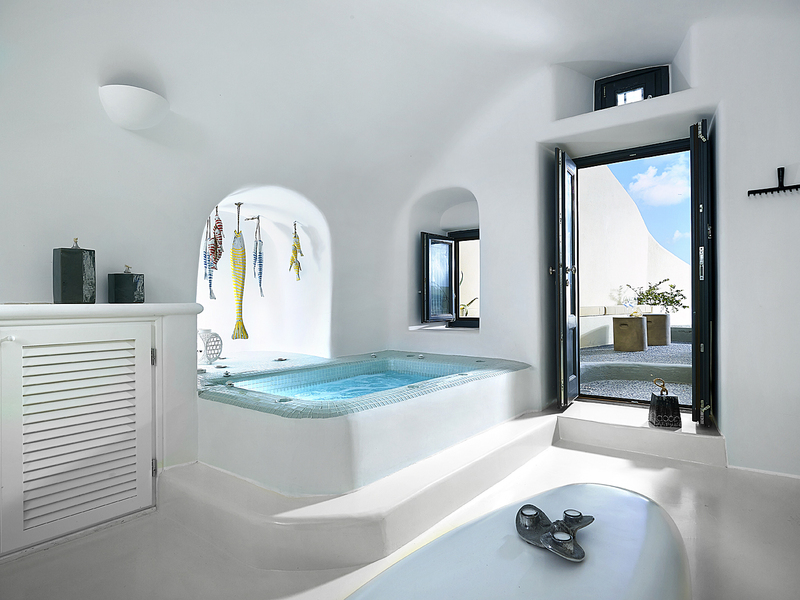 Blue Canaves Oia was an old Vinsanto canava renovated into a luxurious villa ideal for honeymoon or a romantic get-away in Santorini. 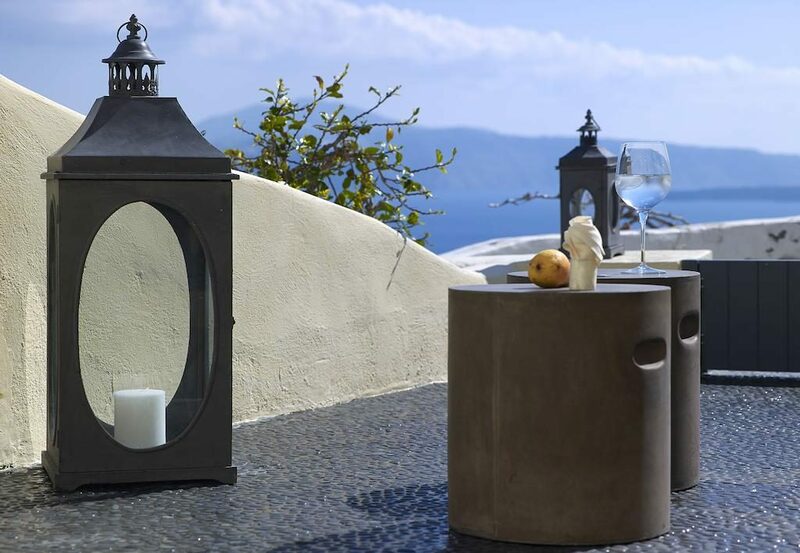 The spectacular private courtyard faces the famous caldera cliffs, the blue Aegean and the infinite sky. 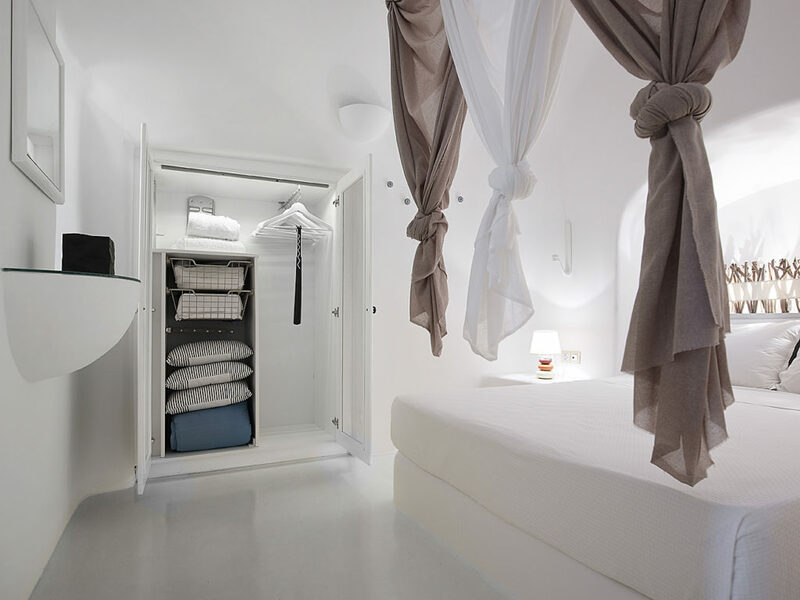 The interior residence was designed individually and defined by the ultimate in comfort. 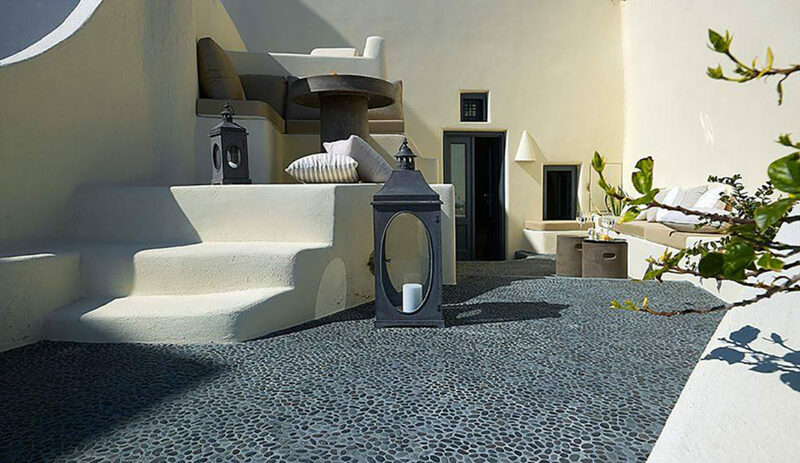 Blue Canaves Villa once served as a winery and cellar or “canava” for producing Vinsanto at the turn of the last century. 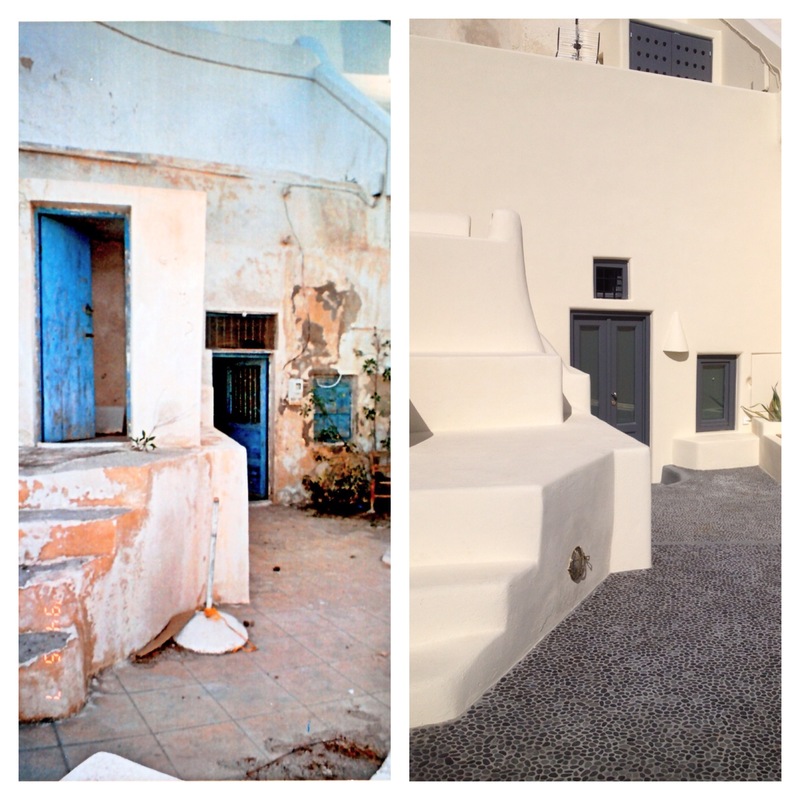 The beautiful organic shape and proportions of the smooth walls, vaulted ceilings and arched openings tell the story of the house and how it was constructed by carving into the soft pumice stone earth of the village hills. 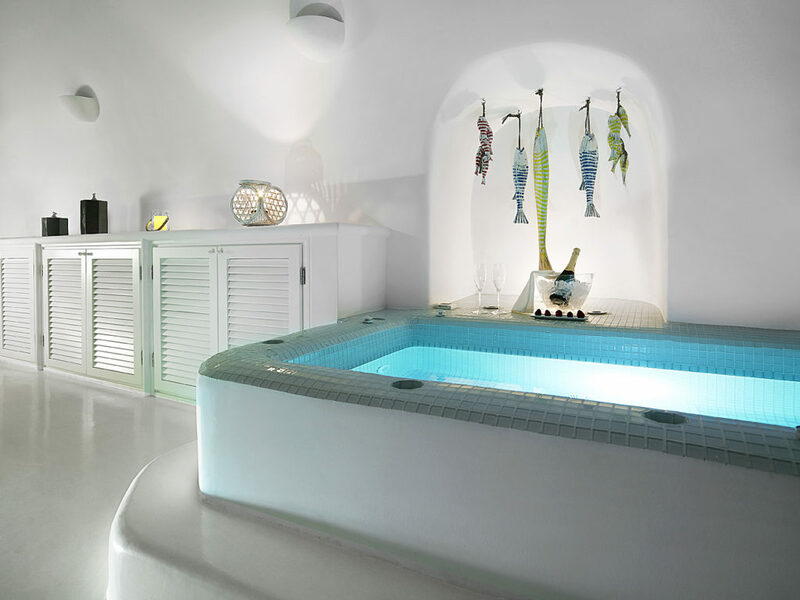 The living area has a warm and elegant touch thanks to the presence of a handcrafted jacuzzi. 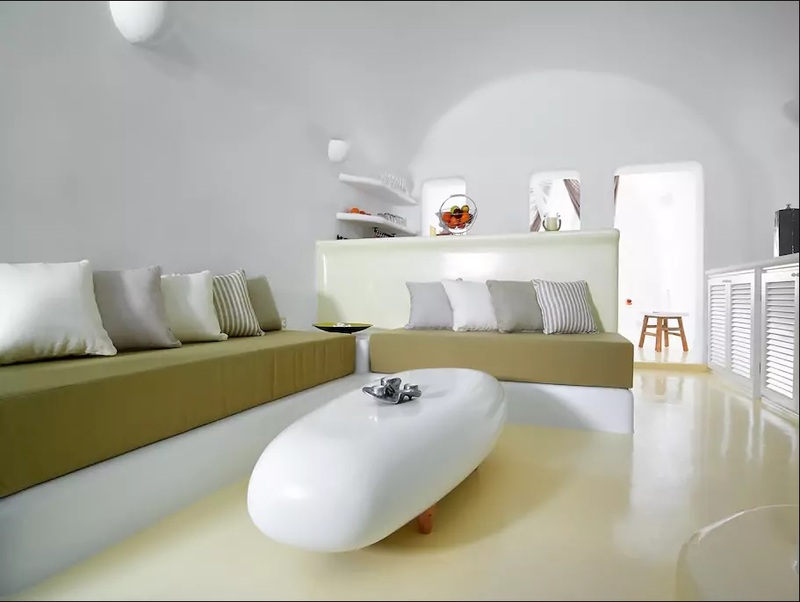 Selected furniture and exquisitely arranged details complete the imposing living area which leads to the kitchen and bedroom. 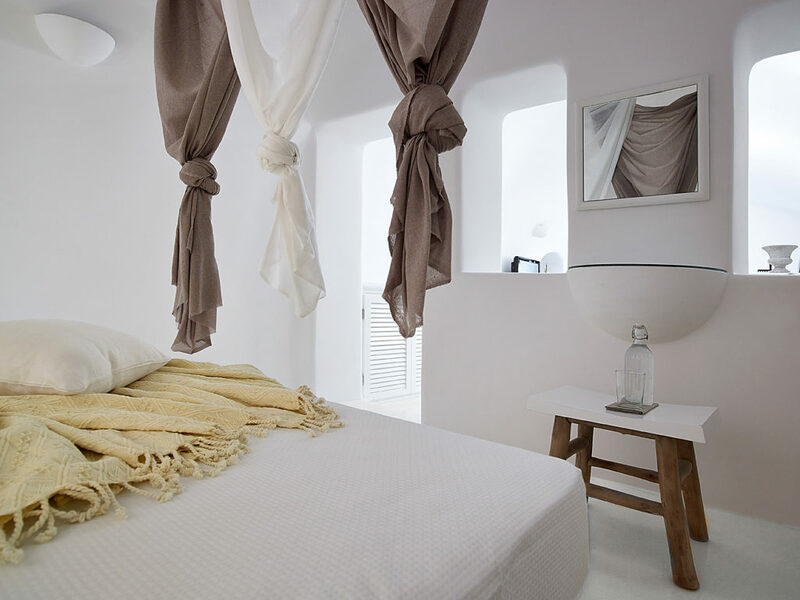 The bedroom is characterized by the whitewashed interior and the sleeping area reflects the island warmth and grandeur. 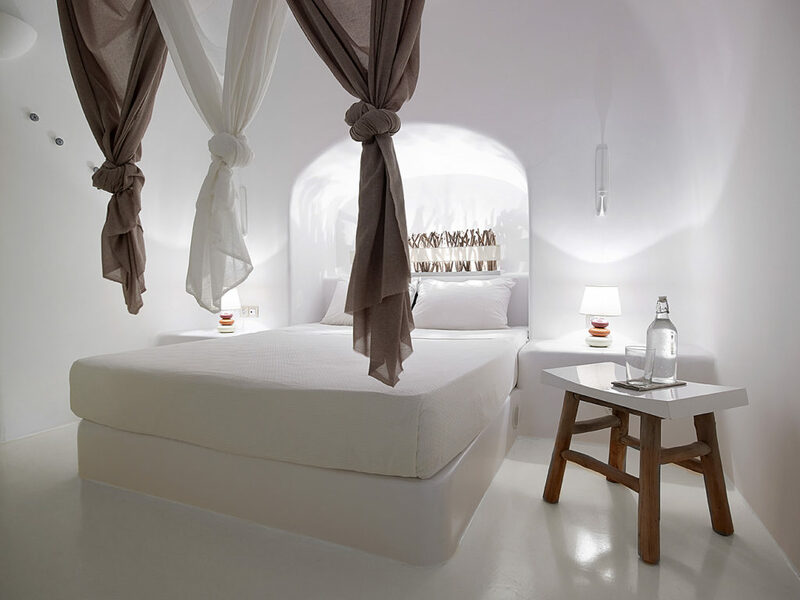 Simple yet luxurious, the bedroom provides optimum relaxation for genuine connoisseurs of luxury living. 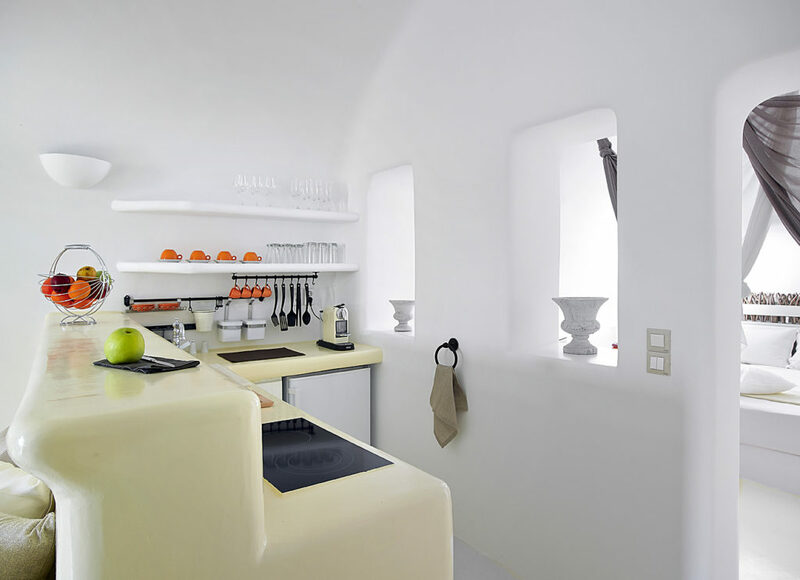 The kitchen with the smooth lines and bright colors is fully equipped with high quality appliances and utensils, ideal for preparing meals and to enjoy them in the direct courtyard. 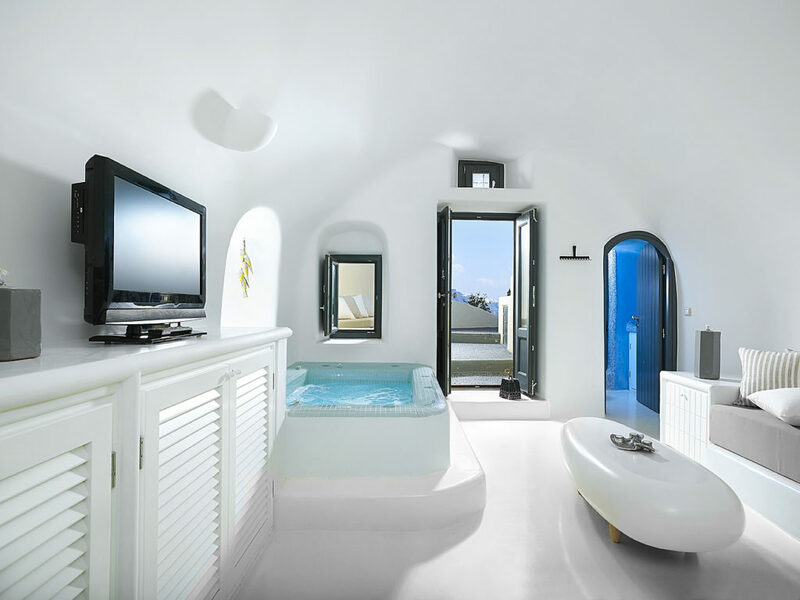 The Bathroom is in harmony with the hues of the Caldera and the sea of the Aegean. 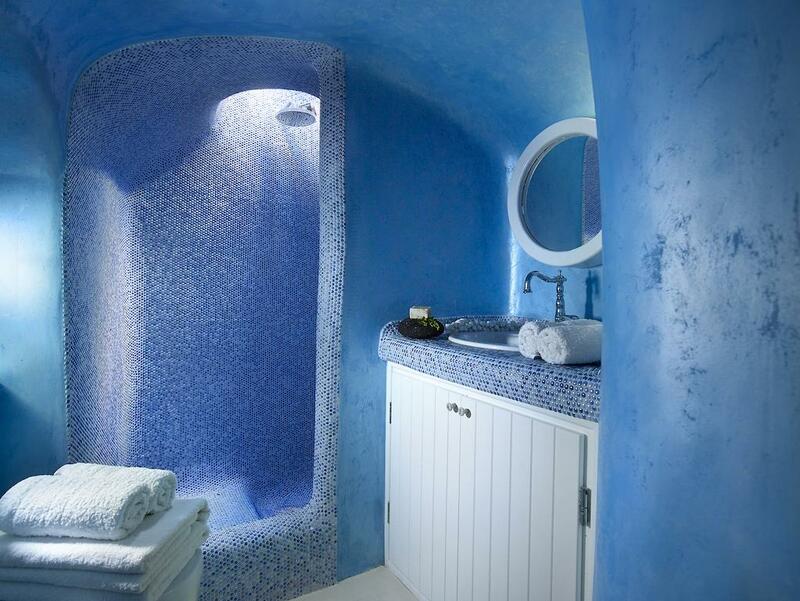 The interior of its curvy shower is glamorous and sparkling. 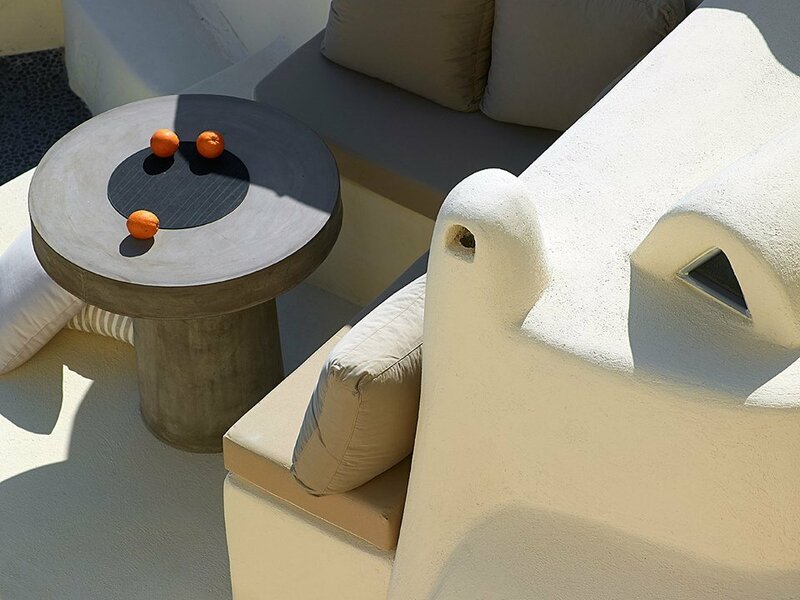 Bold splashes of local art adorn the sculpted plaster walls. 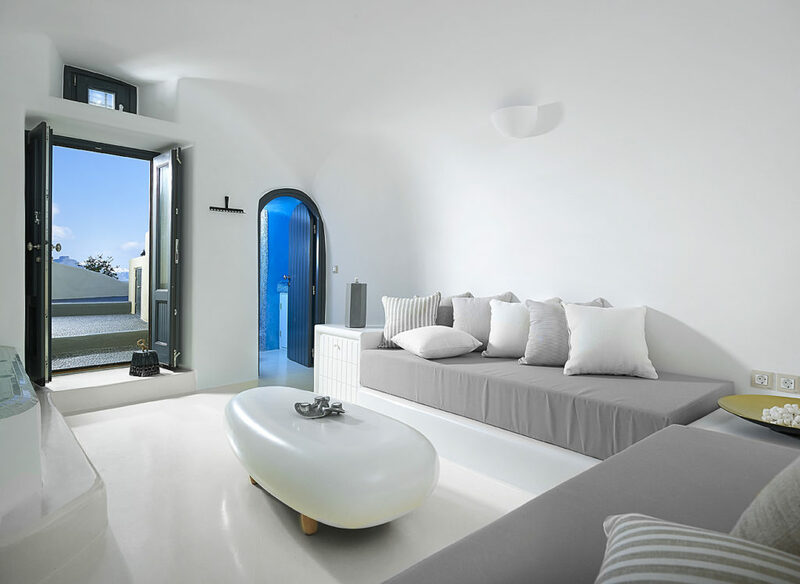 A sensational private courtyard overlooks the Aegean Sea. 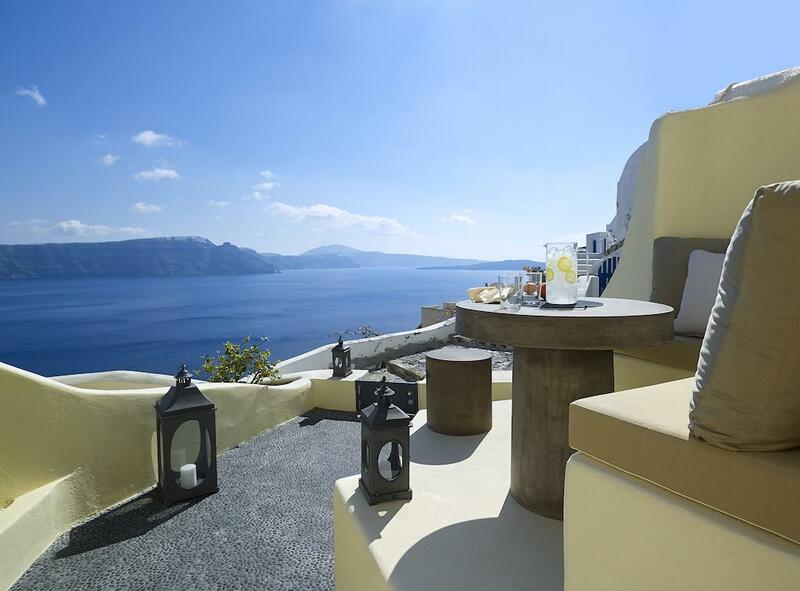 The Sun lounge offers a perfect view of the caldera and volcano. 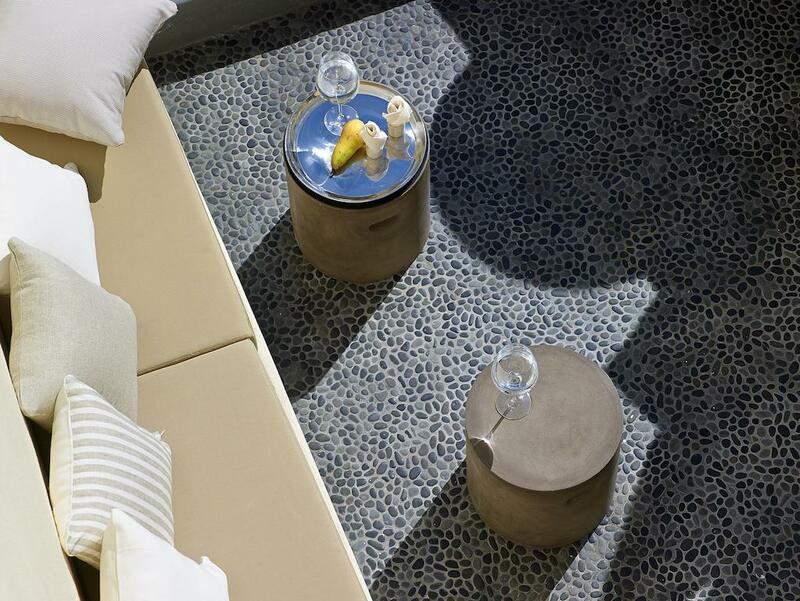 An Open-air dining area on the upper deck with a built-in sofa and a table for 3 people is the ideal place where to spend time admiring the amazing colors of the sky during the sunset.